Someone put his arm across my neck, seemed so close like a buddy. I turned and realised he was Staff Elvin. When did I become so close with him? I first talked to him less than half a year ago when he forgot to return the keys. That was the only bunch of keys I was waiting for and luckily he didn’t bring them home. We walked out to the bus-stop together and then he told me how he planned for his life. I assumed his promotion was faster than usual people but he wasn’t going to renew his contract anymore. He had a push on me for he did some self studying during his free time to upgrade himself. Over times, the short and simple greetings, chats and concern seem to have improved our relationship. It’s so cool life can be – people can get along so well without much interaction. Through looks, through first impression or maybe the manner and respect through the first conversation, you can feel the friendship somehow. This closeness is the motivation and health spawn to live on, in this time of loneliness in the corrupted place. Together with many other kind souls, especially those of higher ranks, they really make it a better place; of course, still not good enough to stay on. Till now, I can’t believe he can be so friendly and he’s behaving like just my age – the drive and liveliness make this happen. He has never put on air, instead, acting more like a brother to me. Sadly but fortunately, he’s leaving the hellish place soon and all we can meet up is one day per week when he’s clearing leave. Kailin’s so sweet that she brought her CDs during the previous beach outing. It had been a few weeks or months since I posted at her blog site that I wanted it; I had long forgotten about it. “雪狼湖” is so far the one and only one musical concert that I’m interested in. Of course, not to the extend that I’d pay for the high ticket price. If only I can make a breakthrough out of my life and able to live a “classy” type of life, I’ll be able to fork out the money; that’s if Jacky Cheung is still doing the concert. Anyway, I’m not so classic type of person. Anyway, she even put in the latest Jay Chou’s album “11月的萧邦” with the two CDs. So many people must be damn jealous of me right now, but actually I’m not even a Jay Chou fan, other than an admirer to some of his songs. However, I’m quite disappointed with the “雪狼湖” CD; sound alone can’t fulfil my desire. I assume, imagine and swear that the concert itself with the acting of the story plot and sound system will be so much better that it will definitely put me in daze. Kailin is really so sweet that I’ve to repeat again and again, to praise her or even idolise her. It’s going to be so troublesome for me to bring any CD to lend anyone and with the fear of having them being damaged or lost somehow (Yes it used to happen so often in the past to my backup files’ CDs). She’s sweet, but not into the prospect of helping me capture images of babes in the beach; and I miss Jasmin’s presence to help me do the job. One Kailun is equivalent to hundred cute boys. Girls don’t want cute boys, they want mature guys. I try to grow up, analyzing words from others and doing self-reflection. I’m sensitive, but girls prefer guys who can sweet-talk. I brush up my language, try to impress upon them; they push me away, for they say love is a kind of feeling which can’t be forced. I used to be naive. I offer helps without thinking and sometimes it’s for wrong persons. I’ve never spared a thought for myself; I’m enjoying the happiness of others. It has been such that sorrow has over-ruled the joy, I fear nothing than to burst in agony. I’m still in the process of upgrading myself, to a level which I’m able to survive in this hectic world. I’m still learning how to enjoy myself and to live through each day optimistically. 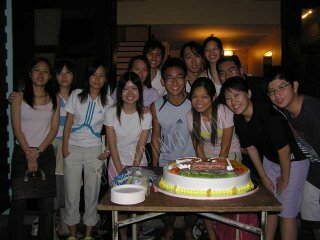 It had been so coincident that when I stayed overnight in camp, things changed in my house. After Range was the arrival of the two dwarf rabbits. Last week after guard duty was the moving of my computer from the “computer” room to the living room. My elder brother had it all done by himself. I wanted to do it since long ago because I couldn’t keep sitting on the bed when I was using the computer without a back rest and proper space to place my legs. Another motive of mine was to avoid going into the room since he brought his girlfriend home sometimes, and also that room was stuffy. On one condition if I were to move out of the room was to remove the ultimate big and bulky fish tank. However he just pushed the fish tank towards right and cleared up the left side of the table to have enough space to put the computer set. I felt it was cramp and I couldn’t put my other stuffs on the table. The telephone my mum had bought for my request was still inside the room, whereas the living room had only a cordless one; I hated cordless phone. The height of the chair and keyboard weren’t suitable as well. Others things were also pushed out from that room – the two computer tables, such that the room was now more spacious and neater. I didn’t know where to keep my old lecture notes – those that of my polytechnic and *** driving course day etc. Nevertheless, there were pros to the shifting. My back could finally rest on something when I was using the computer, certainly helpful for long hours of usage. I’d never be as tired as sitting in the bed, leaning by my side. I could also finally place my hands on the keyboard properly. The weirdest thing I realised on that very day was the missing Jack’s cage. My brother could have brought him out somewhere but I got a feeling it was more than that. At night, I asked, and it was to my institution that Jack was given away. The shock had stabbed right into my heart. Jack had been accompanying us for more than a year, creating mess at my house as well as laughers. He who kept me entertained when I was bored or lonely was then with someone else whom I didn’t know. For all the furs he dropped badly and inability to be toilet trained, it was a right but unacceptable decision. I didn’t even have the chance to hug him before he left. The pain was simply unbearable. I’ve been typing outdated journal entries. I’m lacking of sleep and each day the shortage accumulates to give me a hell heavy head out of sudden. My daily stories haven’t been detailed enough to remind me of the happy events when I want to revive the memories in future. I’m just so lack of time and concentration before I can get some good rest. Last week was a tough week as expected. The guard duty and the moving of computers in camp. There was dinner out with my family and then Jianwei’s birthday chalet the following night. The next day I didn’t manage to catch a wink of sleep and proceeded to the beach. At night was long hours at the Karaoke. I couldn’t adapt to wake up late and therefore I woke up early and eventually made myself more tired than ever. The worse thing was the exhaustion in camp. Carrying twenty-three computer sets from level six without using lift and other heavy loads to be shared among only three persons, I’ve to agree labourers in the army is cheap. Injured men are supposed to work too. The stupid thing was that, I had planned to finish them within two days but we actually worked so hard to finish them in half a day. If the task was given to Lionel, I guessed he would probably take more than a week to finish them. And at the point of time we were sweating so badly, the rest were asleep. My knees on the recovery mood have worsened once again and I don’t know how to get my money from the upcoming IPPT test this Friday. When he can provide her with much more than you do, give them your blessing. She’ll be fine. Be a fool and not be a nuisance. Life may not be wonderful for you but certainly marvellous for them. At least you’re hurt alone – one is better than three. This is where all the hurting stories end; new errand begins. Mike woke me up in a flash of time. There were so many things that he could teach me and I realised I could do more. I was reminded again I was falling behind time. What I had been were earning me nothing; perhaps some compliments were nice but definitely wouldn’t fill my stomach. This drive I’ve to maintain, I’m going to advance beyond my limit. I’ve to start pushing away my current work, set them aside and incline for work that can bring me to greater height. These few days I’ve to sort things out and prioritize my time. I need to stay focus and not lose my concentration. I need to battle against my tiredness. I need to change my mindset and perhaps try to get back my form like in the past when I feared no weariness. I need to overcome my migraine and brain block. I want to be a great man. Girls, I’ve to avoid, making sure no liar would affect me. I need not be afraid of losing my chances, because there isn’t any for me since day one. Nothing’s going to bring me down. I designate my own life, my future and I’m the man who will create miracle. I’m nothing with my poor knowledge, and background, but I’m still the man, who would struggle and not accept defeat. Man does wise up every now and then. I can never be a puppet or clown for life. I love appreciation but rarely anyone would give it to me sincerely. I’m off to find my own life, the route to light, heaven or paradise – be it what you’d consider. This route might lead to coldness. I don’t know what could become me if my caringness, thoughtfulness, helpfulness and other positive attributes are gone. As for now I know I’m not as helpful as in the past anymore. This is what some sensible friends have advised against selfish ones. Whatever the outcome, I owe Mike some credits for sure. He’s someone who will never be selfish to share his knowledge and ideas, someone who should be appreciated. I was finally down at the beach again. Weitat was late for hours as usual, but we didn’t wait for him. It was so exaggerating as we were meeting 1.30pm in the afternoon this time and he was still asleep by then. Sunsetbay was crowded with competition and only one court was available. Anqi was there with Haohao and her friends whom she abandoned. Together with Huiqin, Kailin, Tze Khit and an ang moh, we played by the side of the last court. It was the beginning of the sand invasion towards my eyes and I felt so protected by my spectacle in the past. We started playing in the court without Haohao. I couldn’t really do much with the stiffness on my knees caused by the ultra hard work in camp the day before. I was doing well with the setting for Tze Khit before they made me the permanent one and my nervous mind started to fumble. I wasn’t used to play with the ang moh as well even though he did very well in his blocking. It wasn’t long before my gastric problem aroused again. I managed to continue playing but the pain got me more strengthless as time passed by. Weitat arrived and did his warm-up very well but not in the actual game. When we finally lost, I went to the toilet and eventually got better but it was too late to recover my strength. I didn’t play well anyway but was quite glad to touch the volleyball again after so long. I talked to a little boy who I couldn’t figure out his words. I asked him for his name and then age but nothing from him sounded like English or Chinese. I thought he was a foreigner until his mum spoke up from far. He loved to play passing the ball with me and then I figured out he was singing “Twinkle Twinkle Little Star” – this was a great discovery. We idled for quite some time in the darkness before Weitat and I went to take our bathe. We met up with Kailin and Huiqin before leaving for Harbourfront Centre for dinner. Tze Khit, Anqi and Haohao joined us after some time. After dinner, my Honeydew Sago became Honeydew Nata instead due to shortage of ingredients. I had an uncomfortable night because nobody had informed Kok Chiang about the change of date for the beach. I thought Weitat had informed him and since Anqi said the movie outing supposedly to be scheduled on the same day was cancelled as Kok Chiang wasn’t free, I assumed he wasn’t going to the beach as well. I didn’t know how to explain to him. We walked to the bus-stop and poor Haohao had to go home by himself. I didn’t know if primary six was considered big enough a not, but I felt so much like sending him home first, however, decided not to display my stupidity. We went to Lucky Chinatown Plaza for Karaoke session. The girl who served us looked blur but she amazed me by remembering all the drinks each individual of us had ordered. The selection of songs was good but not the sound system. We couldn’t even have the original voice of singers to help us get the rhythms of the songs. Tze Khit impressed us with his fine manly voice but the song he chose were all English oldies which almost none had passed by my life before. So, all the English songs belonged to Anqi and Tze Khit whereas almost all the Chinese ones belonged to the remaining four of us. All of them made me feel inferior anyway because I really couldn’t sing. It was after 2 in the morning that we stopped. My mum called me right on time. They took cabs home, whereas I strolled along the pubs to my house. By then, my vision wasn’t clear anymore and I realised my eyes were reddish. Recently I’ve been engrossing in two songs (小姐这是我的名片, 兵变) which were introduced by Sheep (Jinyang). I’ve heard them in the Jacky Wu’s variety show “Guess Guess Guess” but never thought I could find them. They’re so cute, cool and meaningful! 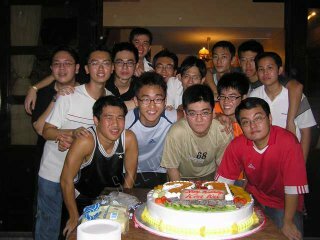 Jianwei’s birthday chalet was good with so many friends around. I went home right after booking out while Ivan, Fredrick and Reuben waited for Rehan at Lot 1. Rehan then drove his cooper down to pick me up, which took very long time as they lost their way. How could my house be so difficult to find when it’s located so near to town and just next to Chinatown and Shenton Way? Anyway, I experienced how good a driver he was, but not to the maximum he could do. They told me how recklessly Rehan had driven all the way to meet me; unfortunately the road was so heavy from my house to our destination. I was so excited to experience how he managed to scare them and how he did turning at the speed of hundred and twenty kilometres per hour, drifting like playing the Initial-D game. Rehan created excitements out of the worst situation by slowing down and then accelerate. The opening of the top of the car allowed wind. He did change lanes to the opposite one and back to the initial one just to overtake a slower vehicle. We actually lost our way. There weren’t as many people as I expected at the chalet. However there were a few cute girls. As the rest of our colleagues arrived, we had more people than his other friends. The lighting wasn’t good and I wasn’t comfortable when I was taking photographs. I felt there was something more I could do to make it better, which I failed. After cutting the 3.5 kilograms of cake, we had fun throwing Jianwei down into the pool. Some girls by the side were enjoying it. Jianwei’s friends left soon after that. I was quite bored when some of them were playing mahjong and it took very long time for Jianwei to get changed up and start to play game. We played the Indian poker and it wasn’t nice when none of them wanted to change their cards. It was pure luck playing and not of wits and acting or sabotaging. Anyway, I was so lucky that I didn’t get to drink any. As almost all of them got tipsy, Gilbert joined in the drunken party and created lots of fun. None of them really believed the doctor told me not to take any alcoholic drink. I didn’t mind drinking if Jianwei were to take the forfeit of kissing his girlfriend for three minutes for me to take photos. The pictures of Kaili and Peiqin kissing during his twenty-first birthday party were still inside my mind, seemed to put time on a pause till this day. However, Jianwei didn’t really appreciate my good intention, or perhaps he was afraid that his girlfriend would be embarrassed even though she didn’t give any objection. I refused to drink. As it got nearer to daylight at five, we started to doze off on the floor.